Sardinia is a land of friendly people, ancient ruins and excellent diving. You can dive all year round in Sardinia. In the summer there is a thermocline around 12 m where temperatures drop to 15 oC or so. In winter temperatures are around 13 oC but this rises to 24 oC in September. July and August are high season. Avoid these months if at all possible: accommodation prices are often double. May, June and September are good months to go. The sea is warm in October (21 oC) but thunder storms possible. There is diving all round the island to suit every taste: caves, wrecks, corals, crustaceans, etc. However, don't expect to see many large fish here. The visibility can be excellent - 40 m - especially in May (although the water is cool then). Sardinia is 250 km long by 100 km wide. One of the busiest areas is in the Northeast which is very upmarket. It is here that you will find the Maddalena islands which are a popular diving destination. A less well known but equally good diving area is Costa Paradiso in the north west. 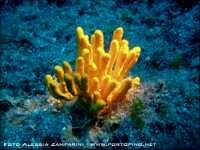 For information on dive operators, see the Sardinia Dive Centres page. For an interactive map of the island see our map page. An excellent dive. It starts with swim down a crevice to a sandy-bottomed cave at around 26 m. A large lobster sometimes lurks here. After peering into the cave you make your way up a chimney to emerge at a shallower level. Have a good look about here for a slipper lobster, Scyllarides latus. This is a primitive looking creature with plates instead of long antennae. Another lobster to watch for is the Palinurus elephas crawfish. Other animals you might see include octopus, red coral, nudibranchs, moray eels and what is believed to be the largest mussel species in the world, the Pinna nobilis fan mussel. Lo Stazzu, incidently, is the name of a hut occupied by a shepherd, one of which is on the shore near to the dive. Descend the anchor line to rocks at around 7 m, then follow the seafloor down. Terrain is very rocky with some beautiful tunnels and caves. Covered in life: nudibranchs (and their egg spirals), sea squirts, small sea fans, delicate pink corals and so on. Larger animals include a conger eel and a crawfish - Palinurus elephas. Big clouds of chromis are also swarming about. Rocky outcrop with caves and tunnels. Look for Octopus, pretty corals, crawfish, nudibranchs, sea bream, moray eels and a well camouflaged Pinna nobilis fan mussel which is protected in Italy. Dive finishes at 6 m.
Take a bright torch for this one as it is a series of tunnels, canyons and caves. Descend down La Punta pinnacle and enter a cave. A short stretch leads to an entrance into a second cave. This leads to an open canyon. At the end of the canyon is a small tunnel with a large lobster. Great dive. Lots of spiny lobsters (crawfish) and a rather large octopus. Not for the faint hearted. Multi-level dive with things to see at all depths. Gullies and pinnacles. Sandy bottom with caves and crags. Large moray, Muraena helena, and, unusually for this area, a large grouper. "Boat dive about 5 minutes from the Harbour. Very good visability, dive depth about 23 m. "
"Boat Dive about 10 minutes from the harbour. The water was cold in parts although it was the end of September and we were diving using 3 mm wetsuits. " "Like an aquarium, easy dive with many different kind of fishes, barracuda, octopus, snapper, grouper, moon fish, eagle ray, many nudibranch, excellent "
"Lots of different fishes, seascape not the best, eagle ray, many flabellina nudibranch. " "Many, many barracuda and yellow snappers swimming together, big crabs, moray eels "
"Killer seascape, lots of barracuda, big grouper, blue clear water, visibility up to 30 m. "
"The kingdom of barracudas. White stones around a wall. Easy dive: max depth 20 m."
"Many many grouper really close to you, eagle ray, moray eels. " "Deep dive with a little caver and a big wall. " "The paradise of divers. A lot of fish, groupers, barracudas, morays and others from Mediterranean Sea. Easy dive, max depth 18m." This is actually a series of caves and tunnels stretching over 350 m. It is not too far from Alghero in the Northwest. There are 3 entrances to the cave: two open and shallow, and one at 30 m. It really needs about 4 dives to do it justice. "Entrance on 30 m, real cave about 35 m into the rock of Capo Caccia, very good visibility. Dive operator: Sardadivers "
"Some of the most exciting cavern dives in the world! " "Big Cave, entrance on 12 m. Very beautiful dive site. Dive operator: Sardadivers "
"Entrance at 7 m, possible to surface inside. Interesting and beautiful dive site. Dive operator: Sardadivers "
Lovely dive with small cliffs, canal and rocks. Lots of little stuff like nudibranchs. The walls are coated in red and yellow cup coral (Parazoanthus axinellae). In a marine reserve you enter the dive through a hole in the rock and swim down a channel. There is a small wall on the right-hand side which eventually turns into boulders when you will probably want to turn back. Make your exit where you started. The dive features large boulders and rock masses with some overhangs. The prettiest bit of the dive is near the entrance. Some big grouper and scorpion fish. A small wreck in which you can swim through the ribs. One part is enclosed and you can enter. Three conger eels live on the wreck and you may also see moray eels. Shallow dive with small arches, swim throughs and rocky outcrops. Big shoals of fish to be seen plus little stuff like brittle stars. Look for the trails of Patella fruginose - big flat limpets which move across the sand. A very shallow dive with archeological interest. This shore dive is the site of two Roman wrecks. You can see amphora and catapult balls. One wreck dates from 200 BC and the other from 200 AD. If you look carefully at the amphora you can see that those from the older wreck are much heavier than those from the later one, showing how pottery techniques advanced over the 400 years. You can do the first part of the dive as a snorkel - enter the sea at the left of the beach and swim straight out a hundred meters or so.
" In my opinion, this dive area is equal if not better than Phuket. The water is colder but better visibility and really interesting underwater landscapes. " Beautiful Gorgognia sea fans in swim-through, moray eel, octopus. "Site reasonably close to Palau harbour (15 minutes away max). Varied dive with plenty to see during deco stop. Fish life plentiful, Conger eels, Octopus, Grouper etc. " Sea fan, nudibranches, school of fishes and pelagics. "Very interesting dive with lots of marine life including Scorpion fish, grouper, king crab, moray eel, conger eel, sea flatworm, hermit crab, spiny lobster, octopus and many others. " "More groupers, barracuda, jacks, different kinds of wrasses, and beautiful nudibranchs in a sheltered setting with calm clear water and very little current. Definitely a dream dive! " "By a large lighthouse on the outer limits of the marine reserve - good drop off with plentiful fish and crustacean life - couple of King Crabs close up (as it was mating season). " "In the La Maddalena Marine Reserve,up close and personal with more groupers than I could count. In 7 years of recreational diving it is like nothing I have seen before." "Good place to commence with putting theory into practice. Did feel the wake of some of the big Ferry boats even though they must have been at least 800 meters away but it was a good learning experience. Saw some fascinating purple coloured fish and some sort of spider-like crab so it was a good dive. " "Lovely site with clear Turquoise water with some interesting underwater creatures. " The archipeligo of La Maddalena is designated a national park and hence is a popular diving destination. "Sea life average but beautiful clear sea and interesting terrain. " "WWII supply ship - intact except for mid section - lies in 32 m. Dive operator: Argonauta Diving. " "WWII beach landing ship - intact and upright - lies in 32 m. Dive operator: Argonauta Diving. " "Huge boulder filed with lots of overhangs and swim throughs. Dive operator: Argonauta Diving. " "Nice envirement with 3-5 shallow caves inhabiting many types of fish and the walls littered with red coral. It's about 10 meters deep. " "An American bomber (b-26 of the 320th bombergroup) crashed into the sea in 1945, only the midsection with wings engines intact, habitat for multiple fish species such as Apogon imberbis. We also saw a mola mola on our way up. Its lying on a sandbed 11 meters deep pretty easy dive but difficult to find! " "Close to the bomber, large boulders and rocks inhabbit this area with giant groupers, sea stars and lots of large white/purple sea urchins. 18 meters deep with even deeper parts if you head into the sea. For all the locations I recommend that you head to the local padi dive center for info/tour. It has a friendly atmosphere and I finished my openwater course there. It's in Santa Maria de Naveressa in the tourist port. " The gulf of Cagliari contains many WWII wrecks. The Romagna was sunk in 1943 by a mine. The wreck is split in two, 800 m apart so two dives are needed to see it all. Lots of anthias, black brittle stars and large scorpion fish. The Entella lies at 9 - 15 m. It was part of a convey in 1943 with two other ships, the Isonzo and the Loredan. The convoy was attacked by the British submarine Safari and the Isonzo and Loredan were sunk outside Torre delle Stelle in over 50 m of water. The Entella headed for shore where her captain scuttled her. It is semi-submerged in sea-grass. An easy dive. "A lot of life as sponges, octopus, parazhoantus, scorpionfish. " "Sometimes lots of barracudas swimming through huge rocks. Some current. Red gorgonias and corals. " Capo Carbonara, East of Cagliari in the south of the Island, is also a marine reserve. One of the best wrecks in Sardinia. The current can be fierce especially near the surface. A 65 m long German ship sunk in 1943. The stern is well preserved but the bow is broken up. This area, south of the Gulf of Olbia in the North East, is a marine reserve. "Fantastic dive, one of the best with lots of groupers, and gorgonian fans "
"Advanced diving in on of the best Mediterranean spots, gorgonias, giant groupers, mooray eels, and sometimes tuna and sharks! " "Wreck dive,with Nitrox. Great group of Dentex fish, huge conger eel,interesting old wreck." "Easy dive but lots of life and great light! " A map and booklet featuring 80 dive sites and centres. Unfortunately, as far as we know, this is only available in Italian from shops in Sardinia. Printed on Laminated plastic so waterproof. 60 high quality images of the fish to be found in the Med. Have a question or comment about diving Sardinia - get in touch.